I’m ready. I’ve been baking cupcakes for a while now, and am now ready to take it to the next level. Inspiration: the Food Network’s Barefoot Contessa meets the lovely Martha Stewart. Hey, why not, right? I would say I started baking cupcakes because they are the easiest (mess-free) way to serve a group without having to deal with the whole ‘cut and serve’ process that comes with a traditional cake. My favorite cupcake (so far) is my coconut cupcake, and I love it so much I needed to see if I could make it better…which I did, when I decided to add pineapples to it –this idea turned out to be a huge hit — and thus was born my first original creation: the pina colada cupcake. My mantra when it comes to cupcakes is to keep it simple, keep it pretty, and keep it sweet! I am going to start playing with some new flavors now, as well as continue to refine the flavors I’ve made in the past — chocolate ganache, carrot cake, vanilla, and of course coconut! I’m excited to explore new ideas for inspiration, from my newest cook book ‘Martha Stewart’s Cupcakes’. I just got this for my birthday from my oh-so-thoughtful husband. I hope you enjoy sharing this journey with me, as well as an actual cupcake here and there from my many future batches. I look forward to expanding my collection under Sweet Creations– my new sweets venture. In 3 parts, alternately add the sifted flour mixture and the buttermilk to the batter, beginning and ending with the dry. Mix until just combined. Fold in 1/2 of the coconut and all of the fresh pineapple. Set aside the remaining 1/2 cup shredded coconut in a shallow bowl. Frost the cupcakes and top with coconut, by ‘dipping’ each cupcake into the bowl of coconut until covered completely. 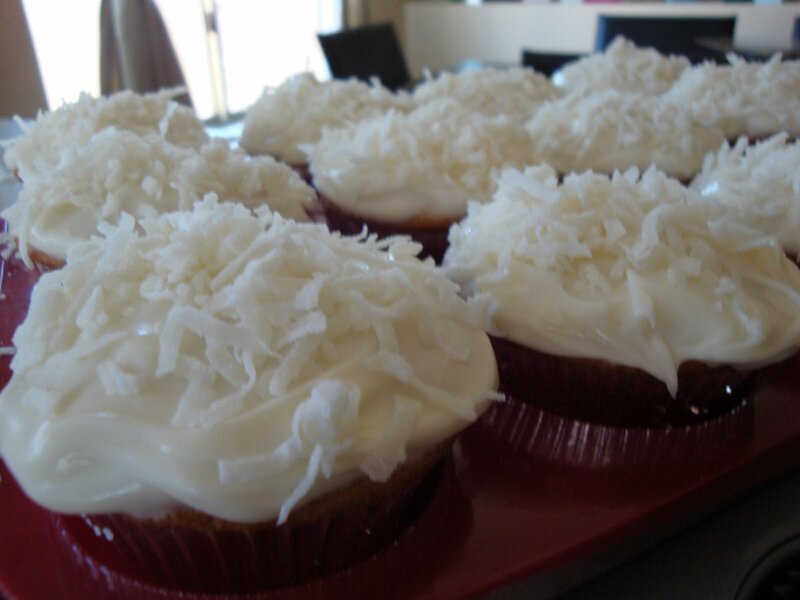 Sprinkle the remaining coconut onto the cupcakes once they’ve been transferred to your serving platter or dish.